When I was seven, my sister and I argued in the car over the 1985 song "Every Time You Go Away." She claimed Paul Young was singing "Every time you go away, you take a piece of me with you." I was appalled, unable to conceive of why my sister viewed the singer's girlfriend as a cannibal who enjoyed walking away with a piece of his flesh every time the two parted ways. I told her it was clear that what Young was actually singing was "Every time you go away, you take a piece of meat with you." Because, you know, every one likes a snack for the road. Anyway, we argued our points, both convinced that we were right, but with no way to prove it. The internet had yet to exist. Such a polite song, right? To stop in the middle of the lyrics to give listeners directions to the bathroom. But it wasn't merely songs we debated about. It was any random topic under the sun. And the conclusion was always the same: There was no conclusion. Unless we were willing to go to the library to research answers to our questions (some of them nearly impossible to research, such as song lyrics or pop culture), we would never know--until we were adults--who was right and who was wrong. It got me thinking: I miss those days. I miss the days where people engaged in lively debates without being able to immediately end the discussion with a quick fact-check on Google. I guess it's a funny thing to miss, but there's something I treasure about debating a pointless or silly topic for hours, knowing I'll never truly know who is right and who is wrong. As a kid, that suspension of an answer stretched a debate out for days, weeks, and sometimes (as was the case with the meat song), years. And then, ten years later when you finally have the solution to the riddle and you can put the argument to rest, it's that much more satisfying. Having answers right at your fingertips with no waiting, wondering, or work (the old www) has taken away something special. Me and my sister ran to Google last week to settle the debate of how many kids The Rock has with his girlfriend and how many he has with his ex-wife. For the record, I was right about the number of kids he has with the girlfriend but wrong about the number of kids he has with his ex, because I swore up and down there were two with both, and my sister said two with the ex and one with the girlfriend, so technically, we were both half right. But we found out his ex is his manager! Isn't that crazy? Lol! My hypothesis: It's not that the internet has made us dumber so much as that it has given us the illusion that we are smarter. The argument between you and your sister has me cracking up Krystal. You two sound just like me and my sis! You do highlight a good point--while searching answers to one question, we often find answers to questions we never asked. Think about how often this has happened while researching a book. It can be pretty interesting! Tom, I think you and Krystal are both right. From the teacher's perspective, my students capacity for critical thinking has been dropping every year. I think if we tested my students' IQs, the average would probably be around the same as it was a decade ago. But here's where it depends on how you define 'intelligence'. Because this generation was born with answers handed to them on a silver platter via Google, they're ability to retain information or troubleshoot a problem is plummeting. Is stamina toward solving a problem the same as intelligence? I'm not sure. Looking forward to checking out that link! I completely agree with this. Kids today (I know, that phrase...) have NO concept of patience, but it's not exactly their fault. They can have any song, any TV episode, any film, and most games downloaded in seconds. We had to wait up all night to press record (and play!) on the boom box for that one song we didn't even know the title of! Or if we were stuck on something in the Legend of Zelda (I mean, not from personal experience... maybe), we had to wait until the next issue of Nintendo Power OR beg Mom to be able to call the tips hotline and get a recording that didn't give any help WHATsoever for the part of the game we were stuck on... now you just Google everything! It's handy, but it also makes me sad. It's made any time we're required to wait for *anything* seem like the most gigundous inconvenience ever. This is a good reminder that waiting shouldn't be so hard, because we've done it before. You just described my childhood to a T Cheyenne! I remember staying up until 2 a.m. one time trying to 'catch' the song "I Will Always Love You" by Whitney Houston on the radio so I could record it. By the time I got the song, I had a dozen mis-starts of other songs and I missed the first 15 seconds of the song I wanted. *cries* Good times. Student: "Mrs. P., the Internet doesn't say anything about why Lewis and Clark were leading an expedition." Me: *looks at their screen* "You're still on Google's homepage." Me: "You have to click on a link." Me: "Google is a search engine, not a resource. It's suggesting all of these articles for you to read." Me (losing patience): "Expecting Google's homepage to give you the answers is like going to a library for answers and looking at different book titles, but never opening up a dang book." Me: "FOR THE LOVE OF ALL THAT IS HOLY AND PURE WILL YOU ACTUALLY OPEN UP AN ARTICLE AND READ SOMETHING! JUST READ!" I completely agree. But then, we're the same age, so we're from the same group of internet-less kids/teens that couldn't win or lose debates instantly. We didn't have access to almost any information instantly. If you ask me, that was pretty awesome. We had to wait for the things we wanted, use or imaginations, and call on our memory for information. 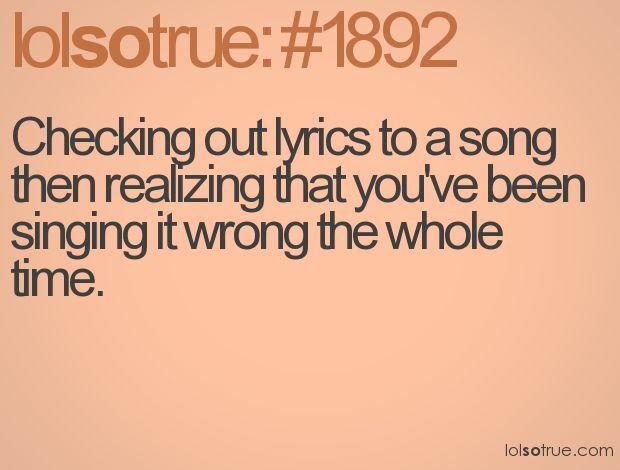 And the music, I mostly just sang whatever I thought they might be saying at the top of my lungs. I wan't all that worried about what they were actually saying. I sang songs at the top of my lungs too, which didn't bother me at all back then, but seems funny now when I picture myself belting out "It doesn't matter if we're naked or not!" (instead of "it doesn't matter if we make it or not" ~Living on a Prayer, Bon Jovi). As far as calling on our memory for information, remember those days when you had like 20 different phone numbers memorized? My students today don't even have one number memorized, unless it's their own (and several don't even know that). Again--it's not their fault that they were born in an era in which they're no longer required to memorize information. It just makes me [nervously] marvel over how the human brain is slowly being rewired, and what that's going to look like in the future. I still sing at the top of my lungs (poor Matt!) and still have the phone number that I grew up with memorized. I would say that these days, I probably have 5 or so numbers memorized, one of which is my own. Other than that, I just check my phone. I think I have more email addresses memorized that phone numbers. "If men learn this, it will implant forgetfulness in their souls; they will cease to exercise memory because they rely on that which is written, calling things to remembrance no longer from within themselves... What you have discovered is a recipe not for memory, but for reminder. And it is no true wisdom that you offer your disciples, but only its semblance, for by telling them of many things without teaching them you will make them seem to know much, while for the most part they know nothing, and as men filled, not with wisdom, but with the conceit of wisdom, they will be a burden to their fellows." He's warning against written language. But, I think it applies here, too. Technology and being able to Google anything we want to know has made remembering and memorizing unnecessary. And I just realized that this comment is so long, I should have taken it to my own blog. Sorry, Jodi! I still have my best friend's number memorized, along with my own home number, Clint's, and my grandma's. If I thought hard about it there's probably one or two more. Love the excerpt by Plato! I did a whole paper on Plato in college and it's amazing to me how much insight he reveals over modern day issues even though those issues took an entirely different form during his time. I could seriously write an entire thesis on the devolution of the written language. I won't write about it here in my blog because I think my views on the manner are almost too radical, but long story short, I feel that texting and social networking is driving us back into caveman days of expression (consider the comparisons between pictographs and emojis). I may be in the minority here but I do appreciate Google. Not for settling arguments but because the dictionary! When I was younger and reading books, I would have a big Oxford Dictionary by my side to check up words like "surreptitiously". Now I can easily look things up if reading with my Kindle. Of course, it could end up making me look into other things and getting distracted in the process, and when I was younger, I had less distraction. An online dictionary is an AMAZING thing. Plus I use thesaurus.com just as much as a dictionary.